Garden Office - Who Has The Best Garden Office? Increasing numbers of people work from home, which is why a high quality garden office can be one of the most practical garden buildings of them all. It not only provides a great place to work, it can also enhance the visual appeal of your garden as a whole, and can even be used for multiple functions such as work, leisure and storage. To help you find a garden office that’s just right for you, WhatShed have created this handy guide to the very best garden offices available online in the UK right now. In a moment, we’ll discuss the criteria we used to define a garden office, but we were pleased to find great examples for our league table. These were then ranked according to a number of factors such as cost and value for money, durability and practicality, and aesthetic appeal. Our first task when creating this guide was to define just what a garden office is. Our first criteria was that they had to be designed primarily as a place to work inside, so a good supply of natural light is essential. That means they have to feature a fully glazed frontage; also, unlike garden rooms, they had to be compact enough to fit unobtrusively within a typical sized garden, so we’ve imposed maximum dimensions of twelve foot by ten foot. Another differentiating factor from garden rooms is that they can have any kind of roof, rather than having a pent roof only. With these criteria in place, we were pleased to find ten excellent models worthy of a place inside our WhatShed league table. Choosing a winner from a diverse selection of garden buildings was difficult, but thanks to it’s superb value for money and long extended warranty period the Hartwood Fairford model is named the best garden office that can be purchased online in the UK today. 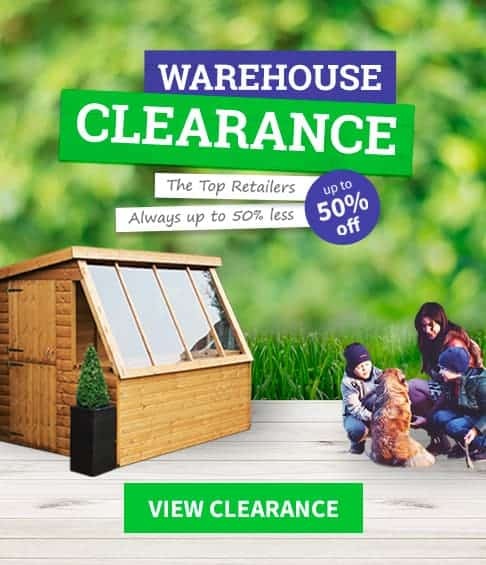 Whether you want a garden building to work in, relax in, or store items in, WhatShed’s independent reviews can help you make a perfect purchasing choice. This is the smallest garden office in our league table, with a base area of approximately eight foot by six foot across a reverse apex design. 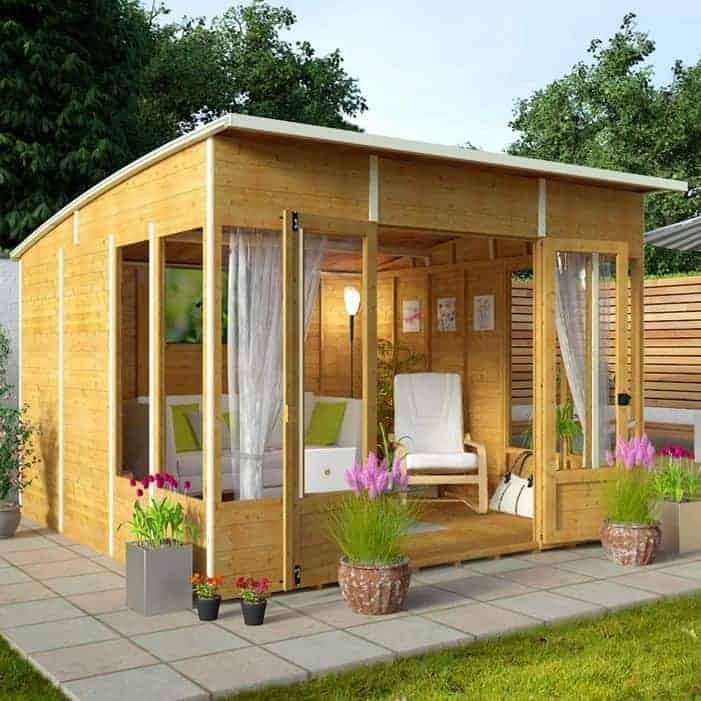 There’s still more than enough space for one person to work inside in comfort, however, and its compact footprint makes it a good choice for people who have a limited amount of lawn space on which to position their garden office. The reverse apex design, meaning that it’s wider at the front than it is deep, also means that it’s ideal for those who have shallow gardens. What really caught our eye, however, was the price tag of not much more than five hundred pounds. This makes it by far the cheapest building in our guide, and earns it the top position in our league table. Appearance wise there’s a little more timber on display than we usually see on a garden office, as tongue and groove boarding runs across the bottom section, but as the front facade is glazed from left to right it still meets our criteria. We were very pleased to find that the cladding had been given an initial pressure treatment as well, as this brings with it a 15 year guarantee against rot. If you want a compact yet durable garden office at an unbeatable price, this is the one to look at. One visual aspect that often separates a garden office from a garden room is that they can utilise other styles of roof than a pent roof. This BillyOh model is an excellent example, as it instead has a curved roof with a slight overhang at the front. This really caught our eye from the moment we saw it, especially as it’s enhanced with white detailing. 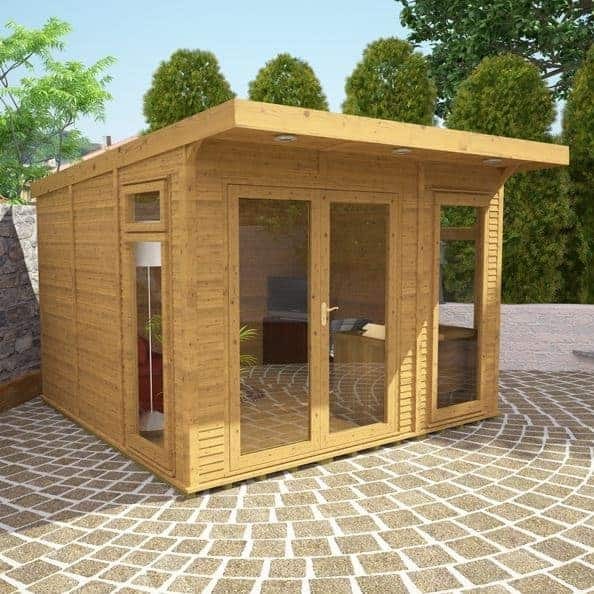 It’s certainly one of the most attractive garden offices we’ve seen, and at approximately nine hundred pounds for the ten foot by ten foot model it’s also one of the most affordable. We do have to point out that a floor isn’t included as standard, as we would have liked, but it costs less than a hundred pounds to add a premium quality floor, so this doesn’t detract from the great value that clinches second place in our league table. The wide opening double doors at the centre of this garden office, fully glazed of course, make it easy to move furniture in and out, so this could easily be used as either a cost effective home office or as a sun room in which to relax or entertain guests. We were also pleased to see a 10 year manufacturer’s guarantee included, even though this is dependent upon annual treatments being applied by the owner. Once again we were struck with the curved roof of this eight foot by eight foot garden office, although in this case it lacks the eye catching white trim and instead adds a diamond shaped finial. We feel it’s sure to attract admiring glances from neighbours and friends, and when an office is as good looking as this one it’s easy to feel motivated and ready to work. It’s also highly effective at carrying rainwater, or even snow, away, and this weather resistance is aided by the tongue and groove cladding that locks tightly together. This not only keeps the interior dry it also helps in the fight against rot, which is one reason that the manufacturer has been able to provide a 10 year guarantee against rot. We were pleased to see that this garden office is protected not only against the elements but against intruders too. That’s because the double doors feature a secure key operated lock, which isn’t always something that we see even on more expensive garden buildings. We feel this is especially important on a garden office as attractive as this one, as it will catch the eye of passers by. The styrene glazing used for the windows can also be a security aid, as although it’s very much a cost effective option it’s also tough and shatter resistant. 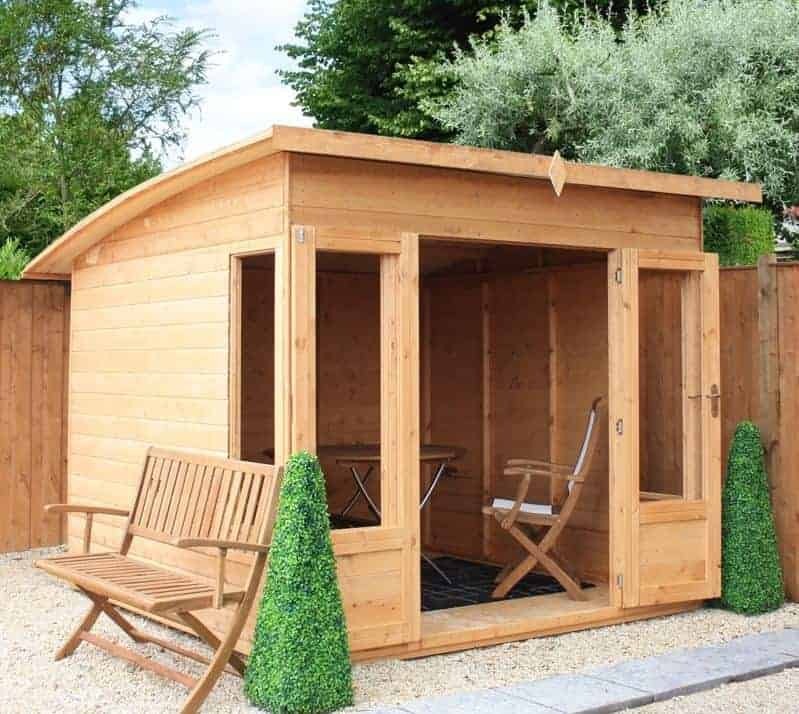 We feel that an eight foot by eight foot base area, as used by this Denby model, is an ideal size for a garden office, as it’s large enough to accept office furniture and equipment and to walk around inside in comfort, and yet not so large that it will take away too much precious lawn space. 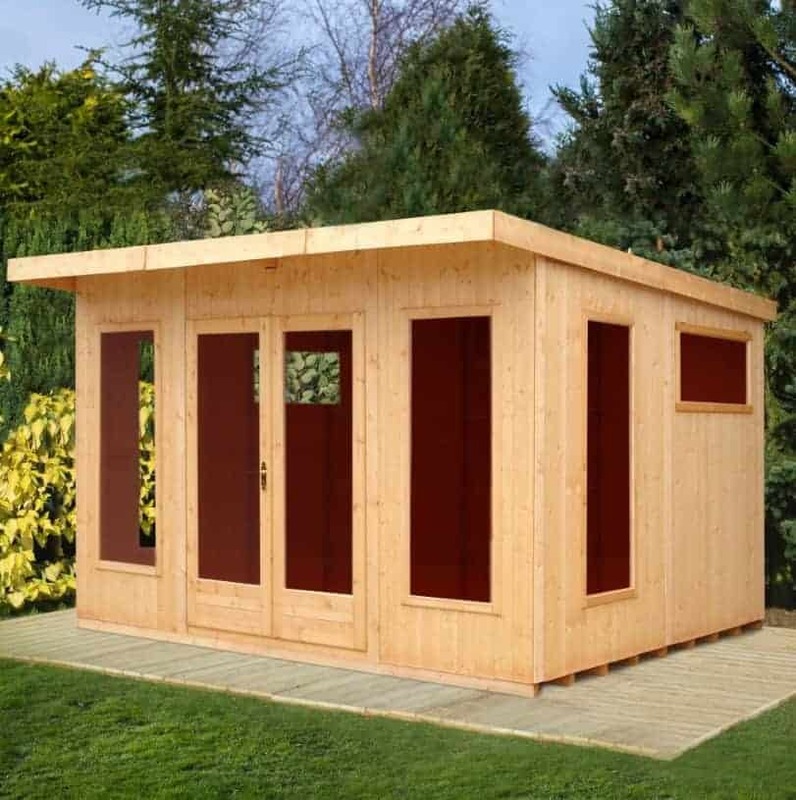 There’s one other reason why it could be an ideal buy for people who are busy running their business from home or working as a sole trader; it’s the only garden office here that’s delivered for free to most parts of the UK and is also supplied ready built. 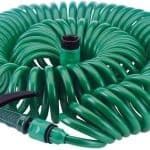 This saves both time and money, which is why it earns a place in the top half of our WhatShed league table. We were also impressed at the use of toughened glass in the windows, making them virtually shatter proof and therefore much more secure. It should also help to create a quieter atmosphere inside the garden office, creating a productive working environment. There’s also the opportunity to add or upgrade features, such as adding a painted finish, a tougher floor, or heavy duty roofing felt. This customisation is something we always welcome, and it’s only the lack of an extended warranty that prevents this from gaining a much higher position in our league table. 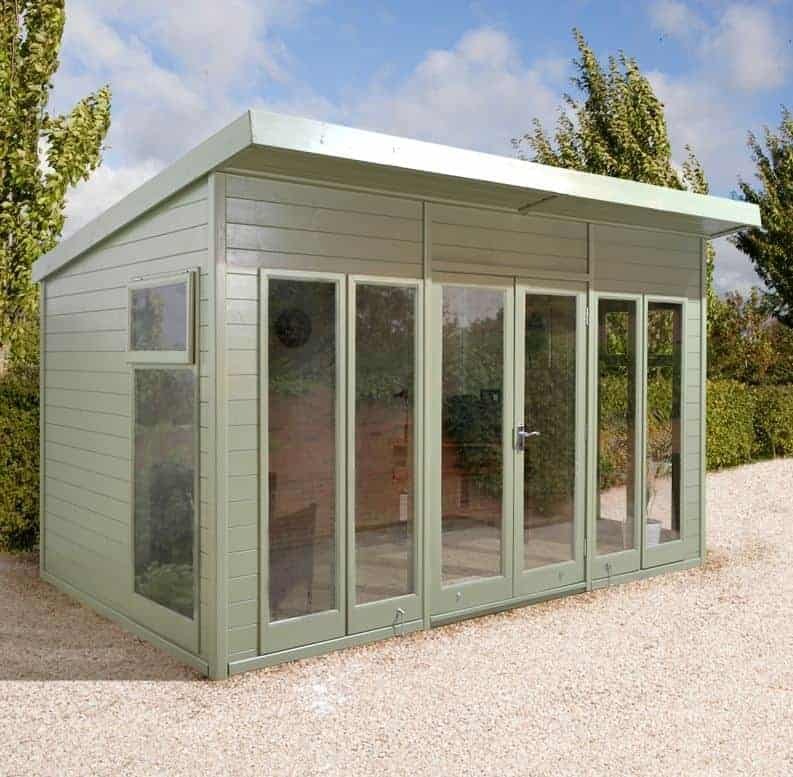 Whilst a half glazed version is also available that makes a good garden room, this fully glazed option makes a high quality and very useful garden office, as its top to toe glazing across the front and long windows on the side should mean that the interior is flooded with natural light. This is essential, of course, whether you use the office as a place to work at a computer or as a place to carry out craft activities. It was also good to see that toughened glass had been used for all the windows, and indeed that the building as a whole was very tough and strong as shown by the use of 34 x 57mm framing, which is much thicker than we usually see on garden buildings of this size. This extra toughness, however, comes at an extra cost, and the high price tag of over three thousand pounds prevents it from gaining a higher position as it otherwise would. 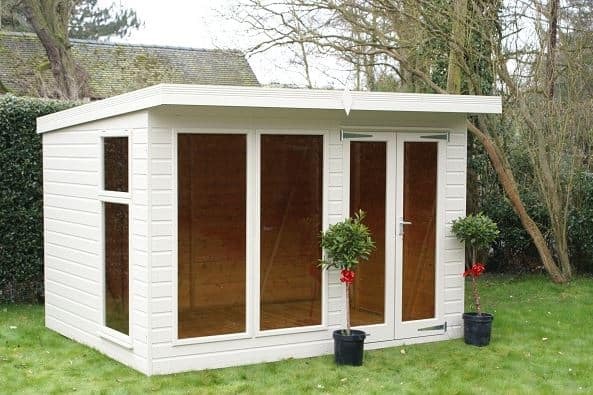 If this falls within your budget, then it could be the garden office you’ve been looking for. It not only looks good, thanks to the use of tongue and groove cladding across a reverse apex design, it’s very durable as well. We were glad to see that the wood had been given an initial pressure treatment by the manufacturer, meaning you can say goodbye to the threat of rot for at least 15 years. This tough and durable garden office shares many of the excellent features of its stable mate above, including crucially the application of an initial pressure treatment that’s guaranteed to keep wet rot away for at least 15 years. This is even more important on a larger than average garden building such as this one, as it also means that the owner doesn’t have to apply their own annual wood preserver treatments. Over a decade and a half this can add up to a considerable saving in both time and money, but although this does add value the initial higher than average asking price has had to be taken into account when determining this office’s position in our league table. Where this garden office differs greatly from the one above it is that it utilises a pent rather than apex roof. This means that it may be able to be situated underneath projecting branches and foliage, and it may also be less visible to passers by which can be a boost to security. Even so, we were impressed with the eaves height of 2.08, which means that there should be no need to duck down when entering this building or when walking around in it. For that reason, it likely feels very spacious and welcoming. A designer label isn’t only for clothing, as this stylish ten foot by eight foot garden office shows. It’s manufactured by Shack Up who are expanding their range of exciting designer garden buildings inspired by Wayne and Geraldine Hemingway, so it should appeal to those who like to display the mark of quality in and around their home. The Shack Up logo is embossed on a side panel, which shows how proud they are of it, and rightly so in our opinion. What made this garden office stand out visually from others that we’ve reviewed is that the reverse apex roof has a significant overhang that creates a canopy. 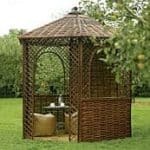 This creates a very handy shaded area on hot, sunny days, as well as adding extra protection against rain, and it caught our eye from the moment we saw it. We also liked the fact that the two side windows can be opened, providing a quick and easy source of ventilation that can come in particularly useful if computers or other machinery is running inside. With the designer name attached we feel this represents good value for money, but the lack of an extended warranty ensures that it has to be content with a place in the lower half of our league table. 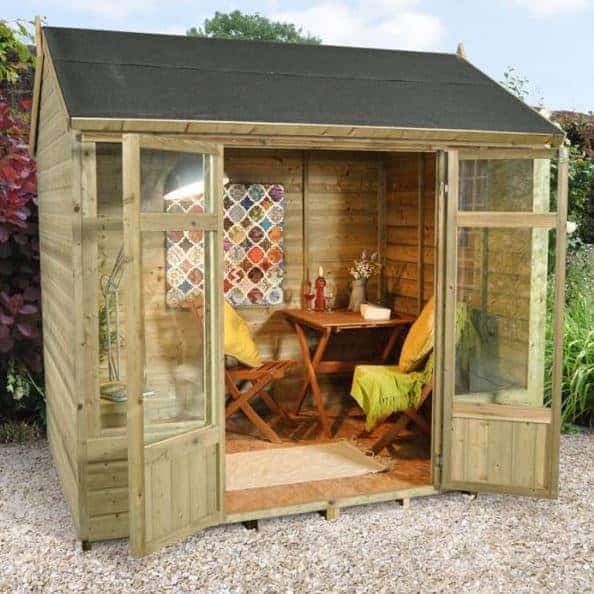 With a base area of ten foot by six foot, once again on a reverse apex which is so typical of this variety of garden building, this is a good choice for people who want a reasonably sized garden office that won’t take up too much garden space. 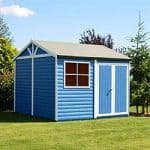 At less than a thousand pounds it also represents reasonable value for money, although once again a one year statutory warranty, rather than the extended warranty we always like to see on garden offices of this quality, keeps it towards the foot of the table when it could otherwise be ranked much higher. We’ve reviewed lots of Shire garden buildings, and they are inevitably good looking and well built, so we were pleased to see that their garden office lived up to expectations. The tongue and groove cladding used throughout, other than the plethora of glazed areas of course, should ensure that this building feels strong and stable once assembled. We were also pleased to find that it comes with integrated floor bearers, as this gives added protection against the threat of rot caused by the high moisture content found at ground level. Another feature we welcomed was the used of 34mm square framing, which is significantly thicker than the 28 x 28mm framing that we often see on similar buildings. 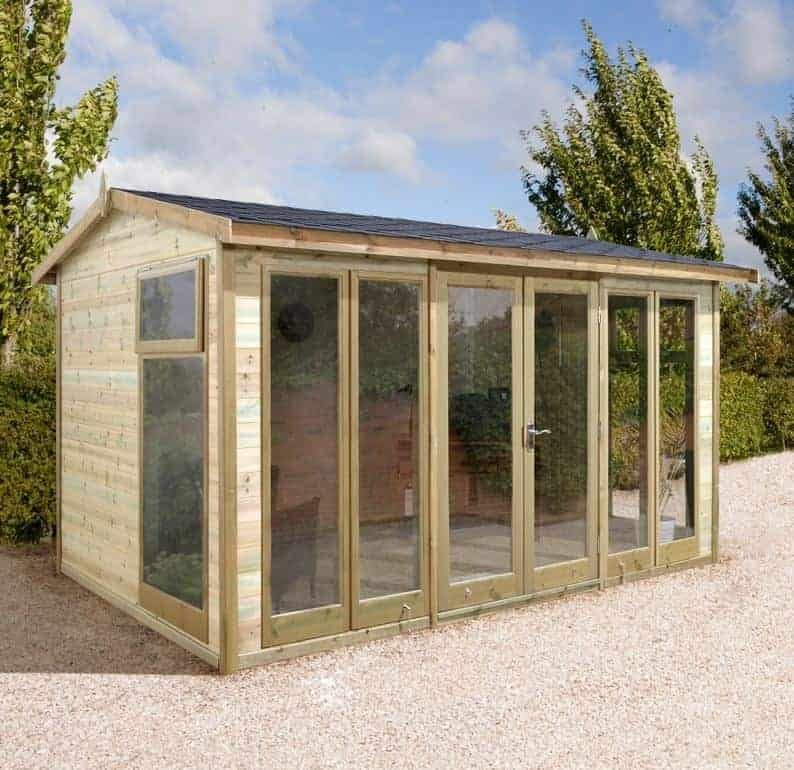 As the name suggests, this shiplap clad garden building could be used to house a home gymnasium or even a spa, although we feel that it’s even more suited to being a high quality garden office. There’s not only glazing across the whole of the front of the building, but also along the width of the side panels too, meaning that all corners of the interior should be well illuminated on a sunny day. We were also glad to see that the double doors feature a key operated lock as well, which means that you won’t have to worry about keeping valuable items such as computer equipment inside. Garden offices are often among the toughest and sturdiest garden buildings that we review, but even when set against a high benchmark we were impressed by how tough and stable this pent roofed garden office is. The frame has a thickness of 40 x 77mm, which is as thick as any we’ve seen on a garden building of this size; that makes it ideal for use in gardens that are in exposed areas or that are often subjected to strong winds. 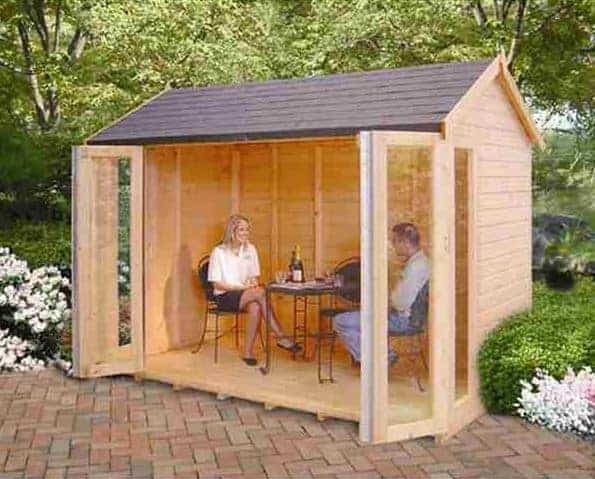 Once again, however, the lack of an extended warranty has had to be taken into account when determining the ranking of this otherwise excellent garden office. This garden office has a feature that no other entry in this league table possesses, in that it has integral insulation. This is an especially useful addition to a garden office as it means that it can be used throughout the year at times when a non insulated building could become too cold or uncomfortable to work in. Typically for insulated buildings, however, it also comes with a large asking price, in this case over five and a half thousand pounds for a base area of approximately ten foot by ten foot, and this is the reason that it has to be to content with the final position in our WhatShed league table. 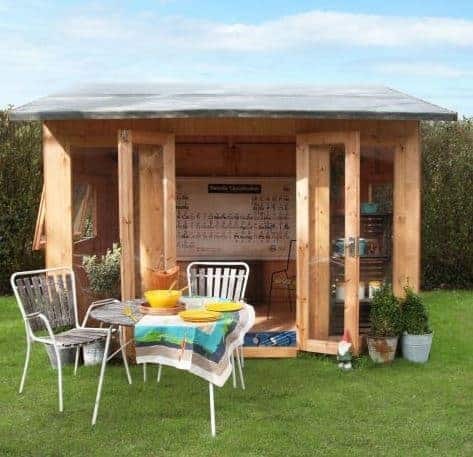 The high price tag of this pent roofed garden office also reflects the high quality of its components, however, and we aren’t just referring to the insulation. 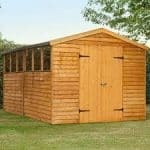 The 16mm floor is thicker than we usually see, which is welcome news if you want to place heavy furniture or equipment inside your garden office, and the double skinned walls are also reassuringly solid and reliable. With a 10 year warranty against rot included as well, we found a lot to like about this building, so if you’re budget stretches to this asking price then you might want to put it at the top of your own league table.